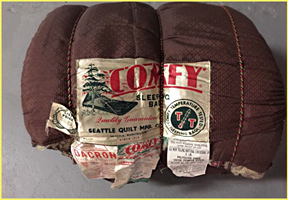 Claims to Fame within The History of Gear-- Seattle Quilt was perhaps the first company to create a true down sleeping bag. This was in about 1920. The bags were nothing like modern, lightweight, nylon-shelled down bags; instead, they were essentially quilts filled with down, given Army duck covers and equipped with harness snaps around the perimeter to snap them into a sleeping-bag like configuration! It's also noteworthy that Seattle Quilt experimented with various baffling systems before and during World War II, including overlapping tube and box-type baffling. 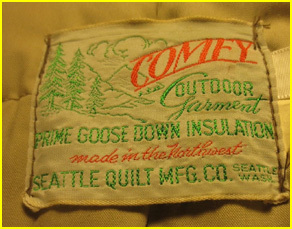 "Comfy" -- this was a brand name officially registered for use by Seattle Quilt in 1936, about 20 years after the founding of Seattle Quilt. The "Comfy" name, however, was in use as early as the 1880s in Latvia, before the founding family moved to America. 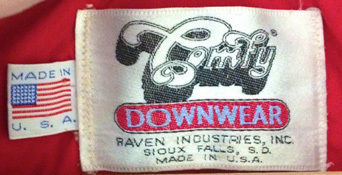 This venerable name was allowed to expire by its then-owner Raven Industries in 1996. Story Source: my main source has been Charles Hammer, whose father was Leonard Hammer, the factory's Production Manager for many years after WW II and into the 50s and 60s until he (Leonard) retired from the company. 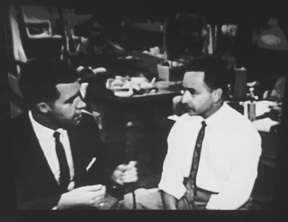 (picture: Leonard being interviewed by KING TV in 1959, Leonard on right).... Mr. Hammer related, " Leonard's Mother was Uncle Charlie's sister. Thus my Dad did not marry into the company but was born into it being Uncle Charlie's nephew." Therefore, Seattle Quilt's owner, Morris Miller, was Mr. Hammer's Uncle and fondly known to Mr. Hammer as "Uncle Morrie." 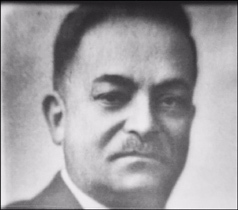 Mr. Hammer as a boy spent much time in the factory and was very familiar with most aspects of the business: "From the cutting room to the down filling rooms, from the repair shop for the machinery to actually sewing, there was very little about the factory I did not know." Charles Hammer (not the Charles who founded the company in 1915) wrote, "For the timeline you really have to start in Riga, Latvia in the late 1880's. There my Great Grandmother, Esther Milwitzky, was making quilts out of her home. According to family lore she was using the name of 'COMFY' to label her wares. About 1895 Esther, along with her husband Issac, sons Jacob, Charles and the rest of a rather large family moved to America to live in Philadelphia. Sometime in 1897 they all became American citizens. By 1915 Jacob and Charles, now called Jack and Charlie, 'Americanized' their family names to Miller and moved to Seattle via a stop working on the Panama Canal. Picture: Founder Charles Miller (Milwitzky).... Charlie and Jack immediately started making quilts like their mother had taught them to make earlier in their life. They called their company Seattle Quilt Mfg Co. They were then working out of a small garage on 21st Ave near Cherry Street. They used the trade name of COMFY to honor their Mother. These quilts were mostly made of cotton and wool with a few, for the more affluent customers, out of down. Soon they moved to 1026 1st Ave S. Most of the down used was either from Europe or America with some also coming from a small Mennonite community out of Calgary. At this time down was usually gotten from plucking the birds seasonally. The birds were mostly raised for the eggs and down and thus were kept alive.... By 1917 growth had forced them to move again, this time to 524 1st Ave S. They had then about 20 sewing machines, mostly making quilts to be sold to local Seattle retail outlets. These quilts were constructed of the sewn-through style. Sometime around 1920 the Alaskan Railroad between Seward and Fairbanks started being built and Seattle Quilt was contracted to make bedding for the workers. 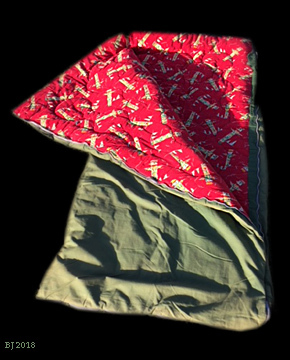 Quilts were given canvas covers and then at first harness snaps followed by snap buttons down the sides and across the bottoms to create what we now call sleeping bags. Very long zippers at that time were extremely expensive and thus not used. Also during this period an overlapping tube style of construction was originated to help insulate without having the warmth being lost through the seams. From now on through WW2 was a boom time for the sleeping bag industry. Seattle Quilt even got a large order from the Quartermaster Corps of the U. S. Army at Fort Mason, California, 6 months prior to Pearl Harbor. Those guys in California must have known something was in the works! By the end of WW2 most of the bags being produced had the box style of construction, probably as it was a more efficient way to sew them up." By 1959, the booming company occupied a 7,000 sz. ft. facility and employed over 100 people in "production," according to Leonard Hammer, with a total workforce of 150-175. Charles Hammer told me that in this era and into the 60s, Seattle was a thriving sewing center for outdoor gear, including such big names as Eddie Bauer, Tempco, Black Manufacturing, Washington Quilt, Roffe (ski wear), Lasley Knits, and Sportcaster. Even Portland, Oregon's big name "Alaska Sleeping Bag Co." "bought enough from Seattle Quilt that we put their own labels on the stuff [we made] for them and drop-shipped much of their orders from our warehouse on 1st. Ave."
BOOK ALERTS: I have written five books about prominent companies in the History of Outdoor Gear. My first was about Frostline Kits of Colorado. Please visit my FROSTLINE PAGE (click here) for a link to order it, or to view a free 15 page PDF preview. The second book is titled, "GERRY, To Live in the Mountains" (click here). The third book describes the story of HolubarMountaineering Ltd. My fourth book is "MSR, Defying Tradition and is about the early days of Mountain Safety Research (MSR)... My fifth book is about Stephenson's Warmlite Equipment Co.. Later this year, I will pull together several related Seattle-area gear companies into one book, among them Seattle Quilt/Comfy. This next book is probably going to be an e-Book in Kindle format. Please Note: All Material above, and in all my "History of Gear" webpages, is copyrighted, and no usage of my material is permitted unless explicit permission is granted by me, Bruce B. Johnson, owner of OregonPhotos.com. ... Editors: Please contact me at oldgear@Oregonphotos.com if you have interest in publishing....Others: if you were involved with one of the old-line, vintage gear companies and have a story to tell in these pages, please contact me soon. Main Page: Essays and pictures about the Pioneers of the Outdoor Gear Revolution, 1935-The Present, 45+ pages, five history of gear books completed, and new material always being added!